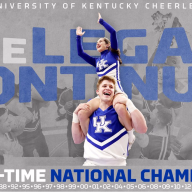 Discussion in 'College Cheerleading, NCATA, & STUNT' started by Kentucky Girl, Sep 26, 2017. Hoping my team makes an appearance! Fingers crossed. The mascot and partner stunt finalists have been announced! Finally, the order of competition is here! Debating getting the live stream... For those who have FloCheer, how good is the service, and is it easy to cancel? I really only want it for this event. It's pretty good, to tell you the truth. In fact, I will be updating on the nationals throughout the event. It gets the job done for sure. A phone call or email to customer service is the quickest way to cancel. I've never had a problem with the stream for this event. This might be a stupid question, but is the Partner/Group Stunt competition streaming anywhere...? I am counting on folks to be posting updates here or something, it's a boy scout outing weekend Sunday.